This summer we have had a run of perfect peaches. Naturally, the bulk of them were eaten straight up, standing over the kitchen sink but always good to save a few for this recipe. I often double this crisp topping and reserve half in the refrigerator – it can keep for weeks. 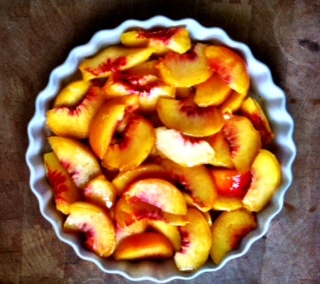 Also try it on top of blueberries, blackberries or a combination with the peaches. In the winter months when only frozen is available, add sugar to taste (between 1/4 to 1/2 cup) and 1 Tbsp of cornstarch tossed in with the frozen fruit – not a bad way to wait until summer returns. 6 peaches, peeled and sliced – to peel peaches, bring to a boil a large pot of water, put peaches in the boiling water for about 15 seconds, take out and cool on a kitchen towel. The skins will slip off. 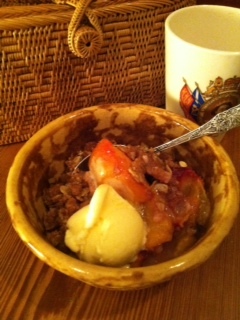 This entry was posted in Recipes and tagged dessert, Oatmeal Crisp Topping, Peach. Bookmark the permalink.